Fast forward four years--changing jobs, then changing careers, moving to a new city, and a ton of other life changes for the better or worse--somehow, this blog has prevailed. It's been the one constant thing that I've kept up with and I'm proud of myself for that. I love sharing recipes and the online community but the blog has also provided a way for me to gather my thoughts and reflect on life. And for that, I'm grateful. I'm going to try to keep this up for as long as I possibly can, although my posts next year might be rather limited. I'm attending four weddings, two bachelor/ette parties (I'm a groomsman! ), and going on a month long trip to India! This is not counting my small excursions with friends to other cities...But I will make it work, because I always do. As for these cupcakes... I intended to make s'mores cupcakes because they've been on my list for so long. Also on my list? These adorable DIY cupcake hats. So the two went hand in hand. 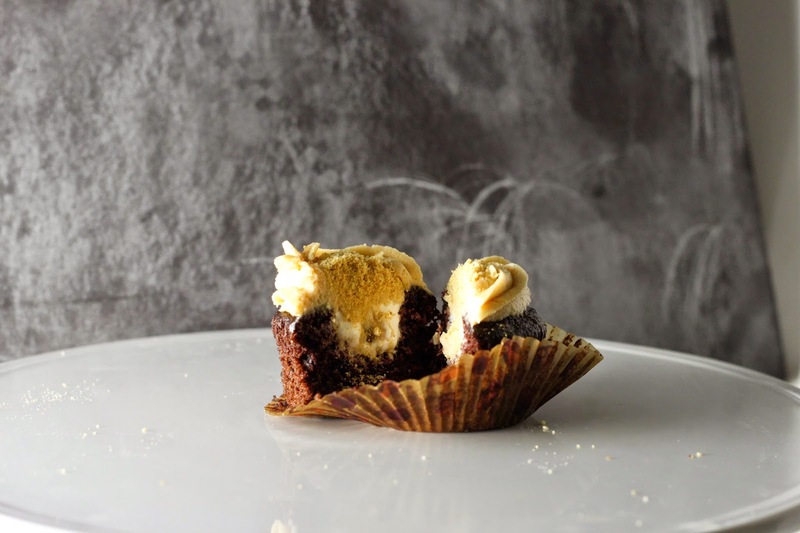 I did a lot of research on s'mores and how to turn them into cupcakes. It usually bothers me when people turn one dessert into another just in name, when in actuality it can't be the other dessert. Like cinnamon roll macarons, which are really just cinnamon flavored macarons... or apple pie cupcakes unless there's actual pie crust involved... So I wanted to at least do my best to get it as close as I could, just in cupcake form. I tried these cupcakes a couple of different ways but none of them were my favorite until these. And incidentally, these don't taste much like s'mores. In fact, I think I've come to the conclusion that I'd rather just eat actual s'mores and then eat these cupcakes. They are a basic chocolate cake (my favorite recipe) from Thomas Keller, filled with toasted nougat. If you're too lazy to make nougat, you can also just toast marshmallow fluff, I won't judge, and no one will be able to tell. 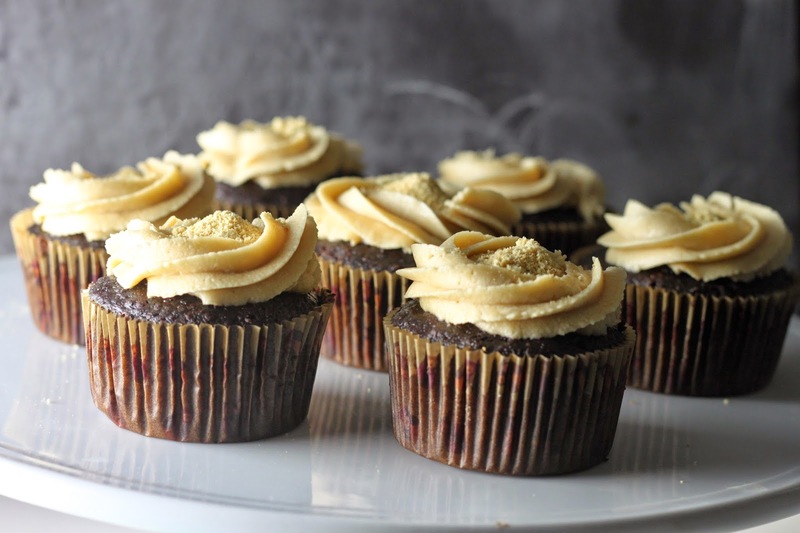 I topped it with a speculoos "cookie butter" frosting which was simply divine. The entire thing basically melts in your mouth. I shared these with many friends and they all loved them. But none of them could tell I was going for a s'mores thing, so of course, I couldn't call them that! Preheat the oven to 325 degrees. Line a cupcake pan with liners. In a bowl, sift the cocoa powder with the flour, baking soda and baking powder. Set aside. In a separate bowl, lightly beat 2 eggs and measure out 56 grams, pouring the measured amount into the bowl of a stand mixer. To the mixer, add the salt, sugar and vanilla extract and beat for 5 minutes, or until the batter is thick and pale yellow. Stop the mixer and scrape down the sides, then beat again until well combined. Beat in the mayonnaise. Fold in the dry ingredients, along with the water. Bake the cupcakes for 16 to 18 minutes, or until they spring back when lightly pressed. While they are baking, make the frosting. Put the egg whites in a bowl of an electric mixer fitted with the whisk attachment. Stir together the sugar, corn syrup, and water in a medium saucepan. Bring to a boil over medium heat and continue to boil without stirring until the mixture reaches 235 degrees F, about 6 minutes. Begin whipping the egg whites on low speed for about 1 minute, just until they are a little frothy. Continue cooking the sugar syrup until it reaches 242 degrees F.
Slowly pour the syrup into the egg whites while whisking on medium-high, aiming for the space between the rim of the bowl and the whisk attachment. Whisk until it reaches a full frothy foam, about 2 minutes. Add the vanilla and salt and keep whipping until stiff peaks, about 3 minutes more. Allow to cool in the bowl and use once it's at room temperature. Spread some nougat out on a baking sheet and torch with a blow torch. Stir and torch again until it's all toasted and mixed up. Use a spoon to add to the center of each cupcake. Store in an airtight container at room temp. for 3 days or in the freezer for 2 months (thaw in the fridge for an hour before using). 1/2 cup speculoos "cookie butter"
Beat all together until fluffy. Adjust the flavors according to your preference--add more sugar or speculoos, as you wish. Happy 4 years! Love the party hats! I totally get your sentiment about reinventing desserts the right way. I always try to keep that in mind. So glad that you have continued blogging and that you moved to St. Louis! Happy Bloggy Birthday! 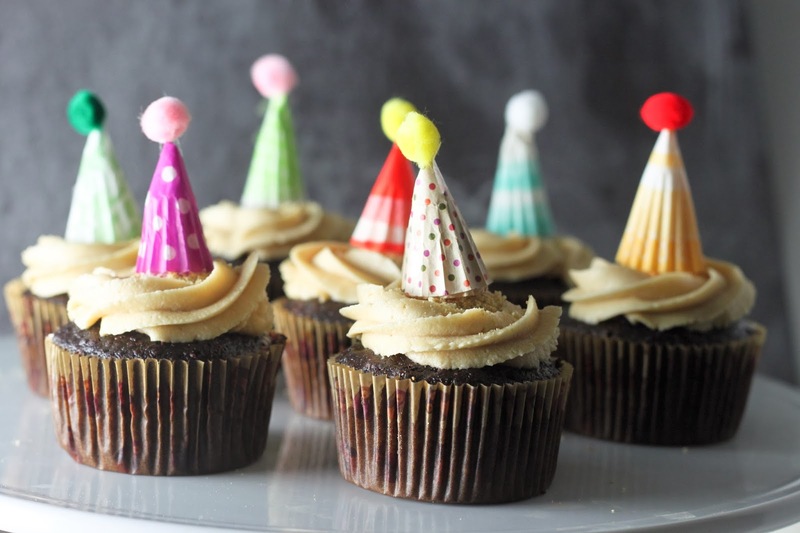 I love, love, love your party hat cupcake photos ... so stinkin' cute! Oh, speaking of those cupcakes ... I want them. I want them all! Hi - Congrats!! 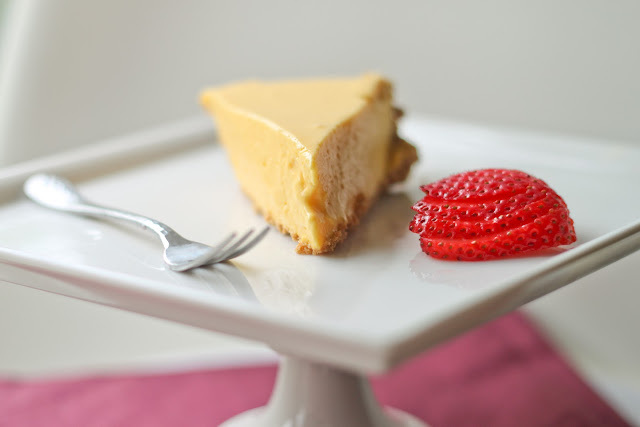 I do hope you find time to continue posting recipes because I love reading your blog! !